Snotty Nose Rez Kids are the combined talents of Yung Trybez and Young D. SNRK blends trap beats with lyrics that challenge Indigenous stereotypes painting their people as ill-mannered savages. Their music is best described as thought-provoking, but slamming, club beats. Audiences dance and sweat to their songs, but leave with new knowledge. Formed by Trybez and D in 2016, Snotty Nose Rez Kids was born out of a life-long friendship between the two emcees, who were drawn to music as an outlet for expression. SNRK dropped two albums in 2017, their debut self-titled LP and The Average Savage just nine months later. Snotty Nose Rez Kids set the stage for establishing the duo as hard-hitting lyricists unafraid to tackle rich subject matter. Garnering fans from all over, SNRK began touring and proving they were not only talented musicians but true entertainers as well. Their energy-filled performances created a quick demand for them in B.C. Their follow-up, The Average Savage, took them to new lengths: in 2018, they toured Canada, the US, and Australia in support of the album. 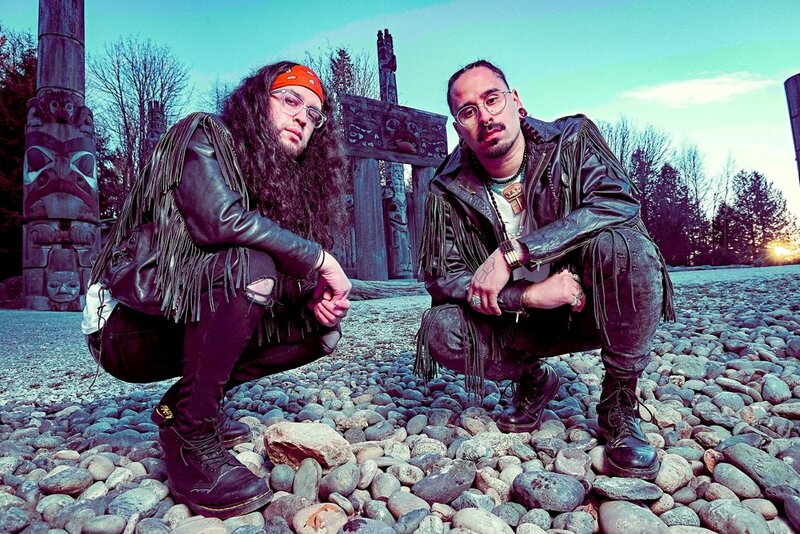 Their single, “Savages,” spent over 20 weeks on the Indigenous Music Countdown. The album landed them a nomination for Best Hip Hop Album at the Indigenous Music Awards, a win for Best Hip Hop Artist at the Western Canadian Music Awards, the shortlist for the Polaris Music Prize, and a Juno nomination for Best Indigenous Music Album of the Year. SNRK just wrapped their first official tour of eight dates across Canada and are now embarking on the Trapline Tour Pt. 1, in support of their next album, TRAPLINE, which includes debut performances in Europe and more Canadian dates.